Thanks Marjon van Leeuwen and Raymond Wortel for this beautiful shot! Saturday 2 April 2011, I went windsurfing with my brother Wouter. He could decide where to go and we went to the Gouwzee, because Wouter wanted to test his 96cm wide board for lightwind. 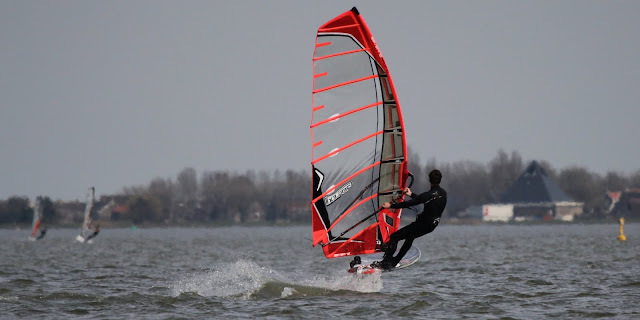 The Gouwzee is a perfect spot for having a good time, many good windsurfers, nice water and a little bit less wind compared to the Amstelmeer. I rigged my brandnew Severne ReflexII 7.8, and used both the iSonic 107 and 127 with Sonntag SL-P fins. On the picture I ride Erik Schram his iSonic 127, what a great ride, what a joy! Another one on my list "what to buy" when I win the lotery ;). Thanks Erik for letting me try 85cm wide iSonic 127!